All transactions are safe and secure with a reliable history in online purchasing behind each of our associates. 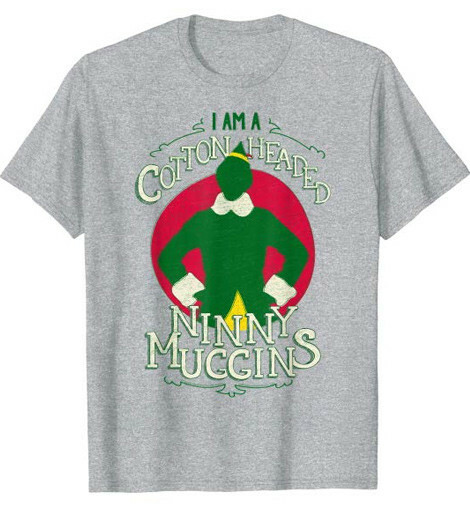 Buy the Cotton Headed Ninny Muggins t-shirt to own Elf clothing and merchandise. Upon hearing that he is 915 off the pace in assembling Etch-a-Sketches, Buddy the Elf gets down on himself. After referring to himself as a cotton headed ninny muggins, the rest of the elves gasp in shock. If this scene sticks in your head every time you watch it, then this is the tee for you. It is available in green in a variety of styles for men, women and children. Pick up this Cotton Headed Ninny Muggins Elf t-shirt for yourself and a Son of a Nutcracker shirt for the holiday fan in your life. In addition to the Cotton Headed Ninny Muggins tee above, browse the Elf Clothing Gallery for more apparel like men's and women's clothes, kids shirts or hoodies.